Those who devote their lives to the gods receive potent gifts from their patrons. 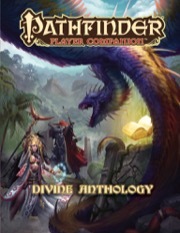 Pathfinder Player Companion: Divine Anthology presents many of these powers, both sacred and profane, along with the holy books in which they're found. The secrets revealed in these pages are not limited to those who can cast divine magic, though�faith in the appropriate religion is the only requirement for using many of the revelations and ancient techniques hidden away in the prayer books detailed within. Several new magic items, traits, feats, and spells, including a new category of magic: meditative spells. A wealth of new options for characters from arcanists to bards and from clerics to paladins, including the mysteries of apocryphal subdomains and new paladin oaths. New archetypes, new fighting styles, and additional information about a wide range of faiths and religions.